Week 15 Reading Comprehension (B-15). 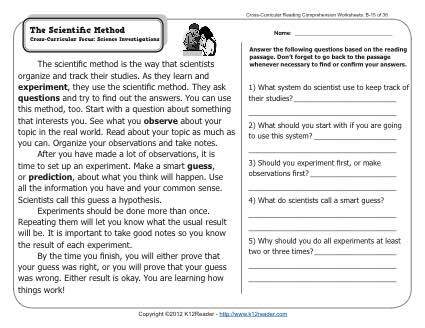 Reading segment and questions about using the scientific method in experiments. Cross-Curricular Focus: Science Investigations. This worksheet is in line with Common Core Standards for 2nd and 3rd grade Key Ideas and Details, but may also be used for other grades. The passage’s Lexile Level is 610.